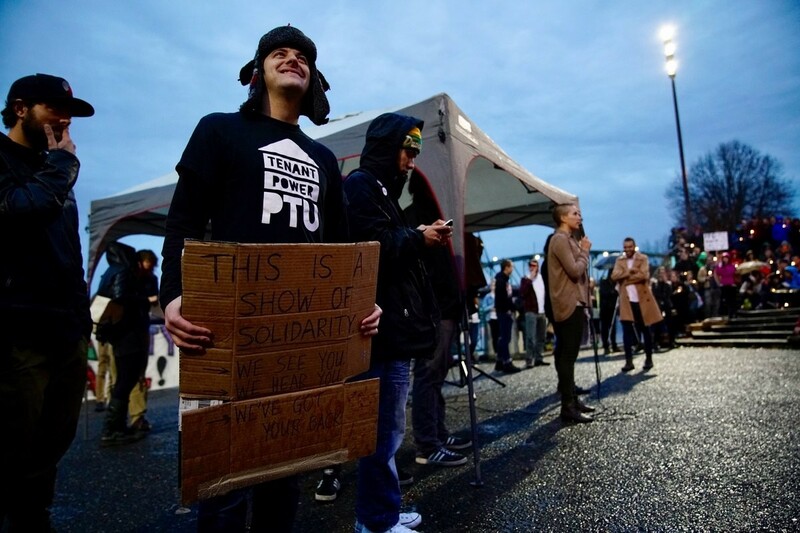 On Thursday, April 7, 2016, Portland Tenants United (PTU), the Portland, Oregon, based tenants’ union, descended on the Multnomah County building with hundreds of supporters. Since the City of Portland declared a renter state of emergency six months ago, organizers argue that the rental crisis in the hip urban areas of Portland has only gotten worse, with the city standing out with the fastest rent increases in the nation. After recent attempts at comprehensive renter protections were blocked at the state level from the influence of the landlord lobby and the limitations on the meager citywide rental protections established last fall by the mayor’s office, PTU and other housing and wage activists are demanding a metro-wide rent freeze and a moratorium on all no-cause evictions until a permanent solution can be put in place. They demand that these solutions be enough to tip the balance of power in favor of renters and brings rent control back to Oregon. Speakers told stories of massive rent increases, the loss of Home Forward benefits, being pushed out of neighborhoods they had raised families in for years and the mass displacement that accompanies the reshaping of the entire region. Once inside, protesters overwhelmed the county commission meeting by sharing their frustration over the inaction of county, city and state officials to confront the increasing rents, and what organizers call an “epidemic” of no-cause evictions. Tenants on the verge of eviction shared stories about working overtime well into retirement, the sexual assault and violence seen when evictions forced them onto the streets and even the possible displacement of a critically ill woman who is joining the federal liver transplant list. This confrontation is part of a larger campaign from Portland Tenants United, which hopes to unite renters around the demands for common protections. Rent control continues to be illegal on the state level in Oregon — a problem that activists are taking note of in states around the country. This rental crisis is not unique to Portland as the working-class constituents of growing urban areas around the country, such as Brooklyn or the Mission District of San Francisco, are being pushed out in a mass wave of gentrification. Originally published at truthout.org, 2016.